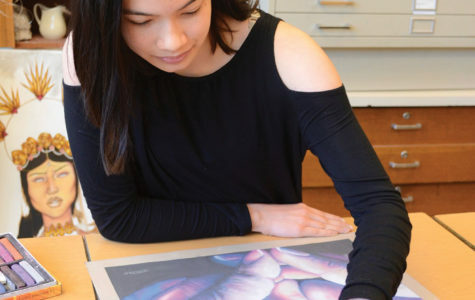 Artist and sophomore Jiwon Yu uses colored pencils to work on her Frida Kahlo portrait. 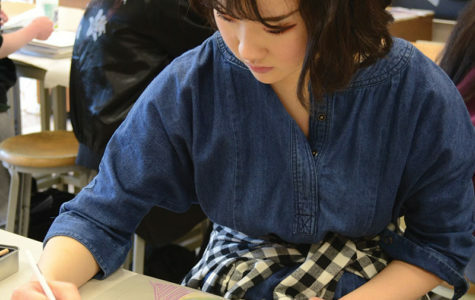 Yu said she added her own twist to the portrait in order to personalize it. 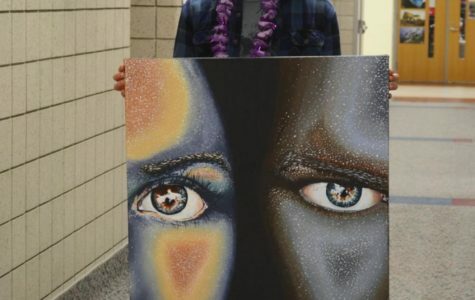 Artist and junior Jacob Freedman displays his semi-realistic piece that he said depicts a monster and a human. Freedman said he was trying to demonstrate different emotions through the facial expressions of each figure in the painting. 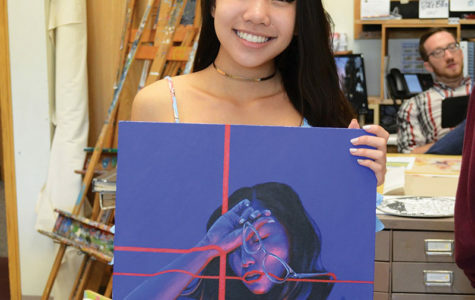 Artist and junior Katie Phan displays her art show piece. Phan said she wanted to use vibrant colors in her piece to convey an idea of boldness. Artist and sophomore Natalie Wells colors in final touches with white chalk on one of her pieces. Wells said she tries to redraw pictures and express what she’s feeling at the moment.